This week, John joins us again to talk about an app that claims to diagnose your car, the troubles with body pains, diets and sleeping, the Nintendo 2DS, a failure, a batch of #AskError & more! + (00:00:12) – A Phone app that (supposedly) diagnoses your car engine. + (00:03:58) – #AskError: What did your family make out to be more expensive than it really was? 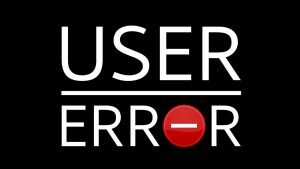 + (00:08:20) – #AskError: What commonly held scientific belief is false? + (00:18:54) – Core muscles are the worst to injure. + (00:22:22) – Chris needs a new way to sleep. + (00:32:54) – #AskError: What seemed great as a kid but awful as an adult, or vice versa. + (00:37:58) – Chris looks back on a year of the vlog. + (00:50:10) – The Nintendo 2DS is an interesting device.